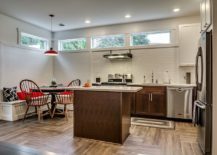 We are always looking for ways that we can combine aesthetics with smart, space-savvy décor to create a more efficient and ergonomic modern home. 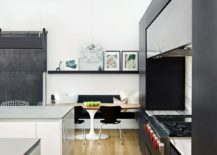 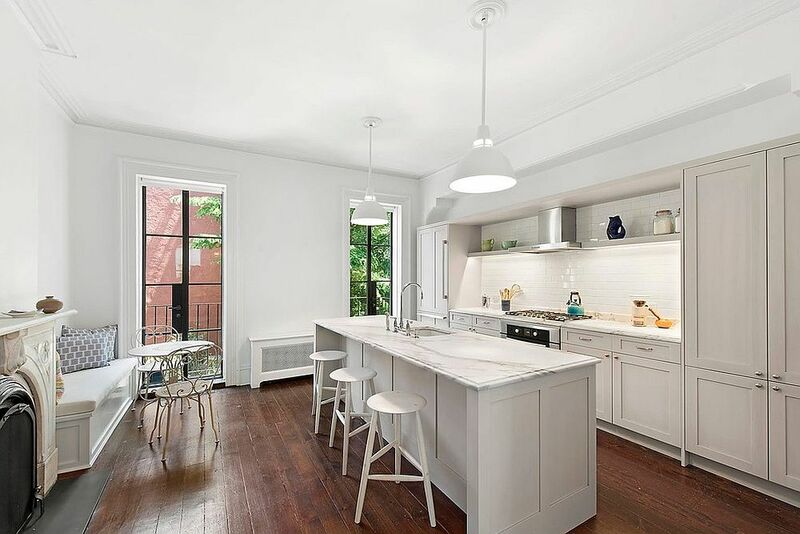 When it comes to kitchen and dining spaces in contemporary apartments and urban residences, the line is pretty blurred with one space flowing into the next. 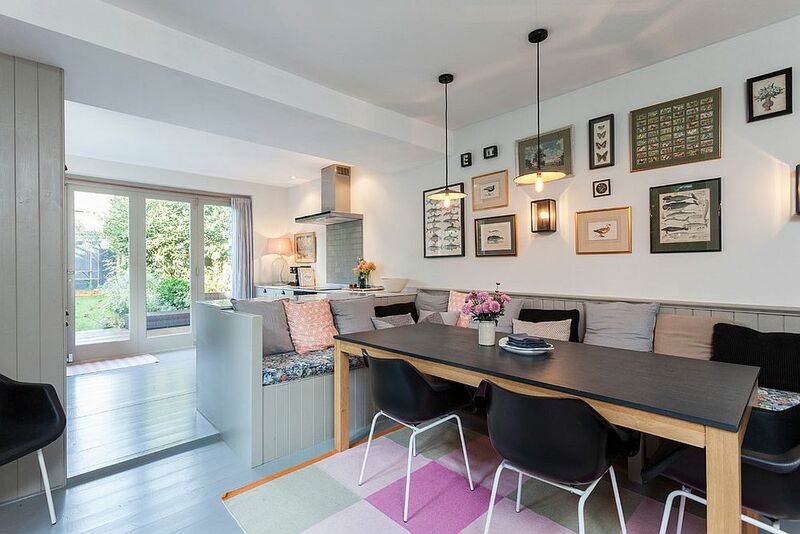 The ever-growing popularity of open plan living has only helped in bringing the dining room and kitchen together further, and we are currently at a point where the formal, dedicated dining room is a rarity of sorts! 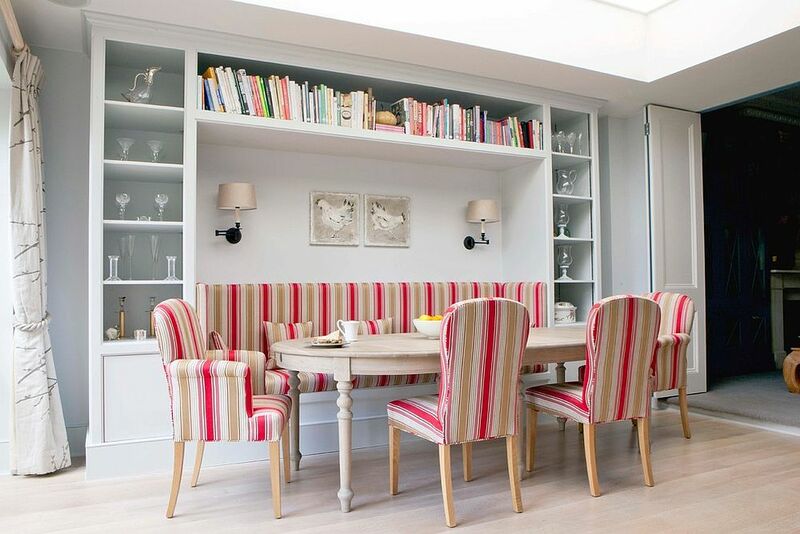 It is in interiors like this that banquette seating is a great, space-conscious option. 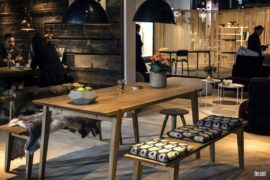 Scandinavian design is inherently minimal, contemporary and places frugality and functionality at the top of its wish list. 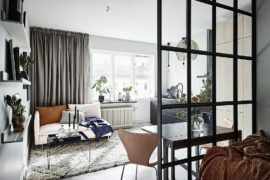 Yet there is something undeniably cozy and inviting about Scandinavian dining rooms that allow them to be both refined and comfortable at the same time. 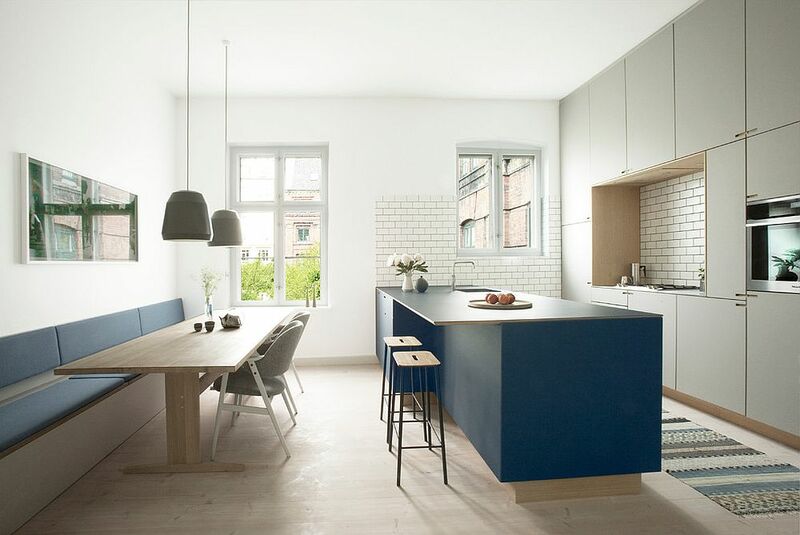 It is precisely for this reason that the banquette seating in Scandinavian dining rooms and kitchens looks great. 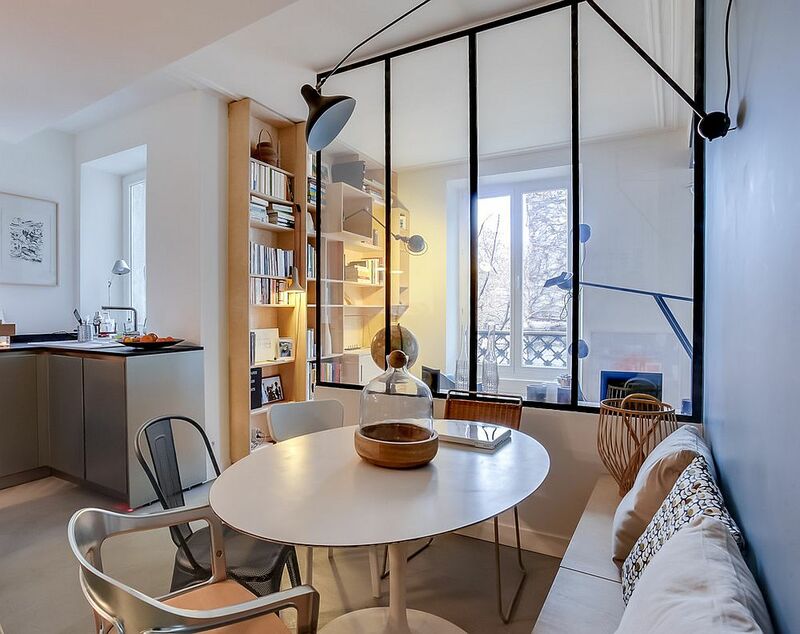 Bringing flexibility to the floor plan and creating a happy social zone for the entire family, the list of advantages goes on. 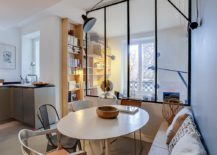 If you are still not convinced, then the 20 inspirations below should change your mind! 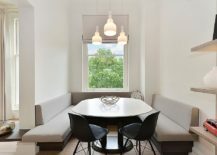 If maximizing corner space is your biggest concern, then there are few solutions that work as well as banquette seating. 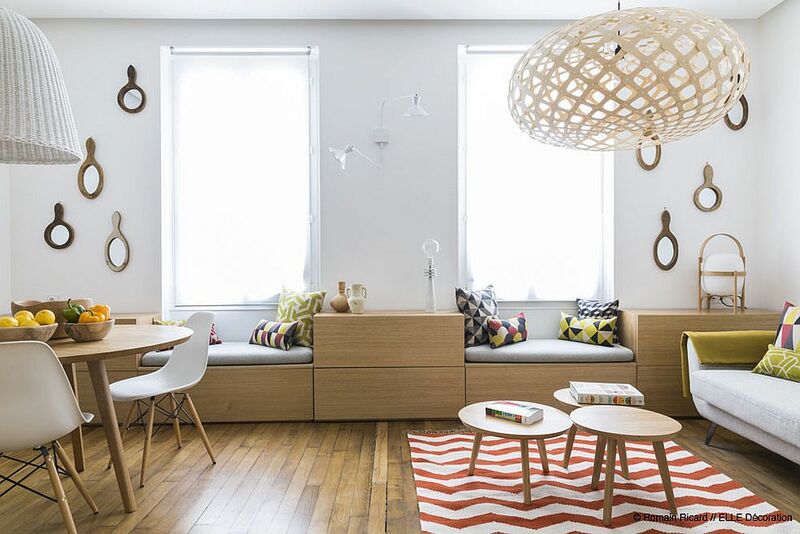 While the focus today is on banquettes in the kitchen and dining space, they can also easily fit into Scandinavian-style bedrooms and living spaces and morph into relaxing window seats and daybeds with built-in storage. 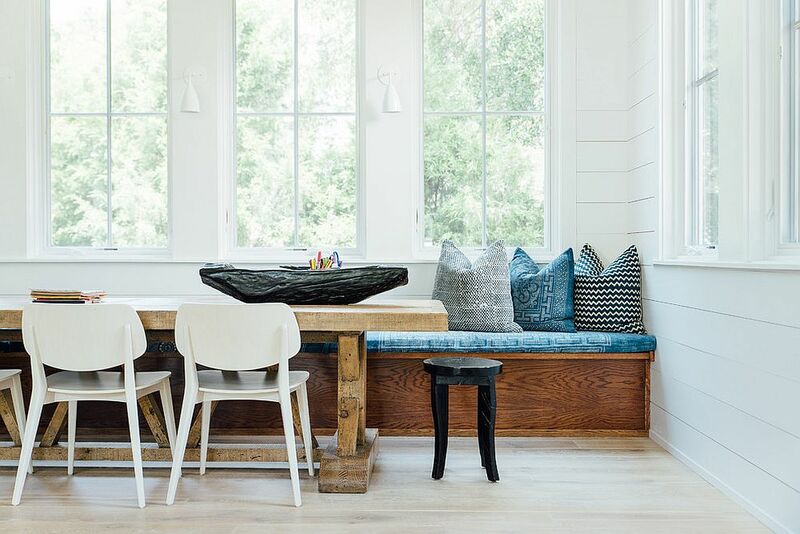 In the Scandinavian kitchen, a corner banquette can offer a wonderful breakfast zone for a couple or even maximize seating space for a large family. 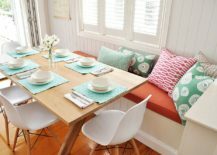 Instead of decorating with an indoor plant or just placing a small shelf, banquette seating allows you to efficiently utilize even the awkward corner. 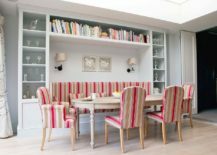 But how do you ensure that the banquette fits into the style of the kitchen or the dining space you envisioned for open plan living? 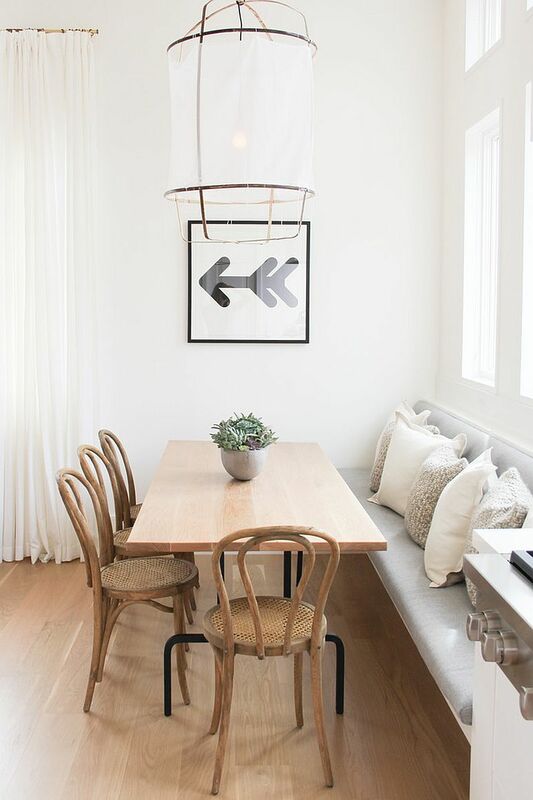 A good start would be to opt for a wooden bench that does away with excesses and embraces clean design along with simple, straight lines. 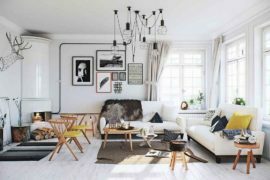 Tufted seating or extravagant U-shaped or curved banquettes really do not fit in with the unassuming charm of Scandinavian style. 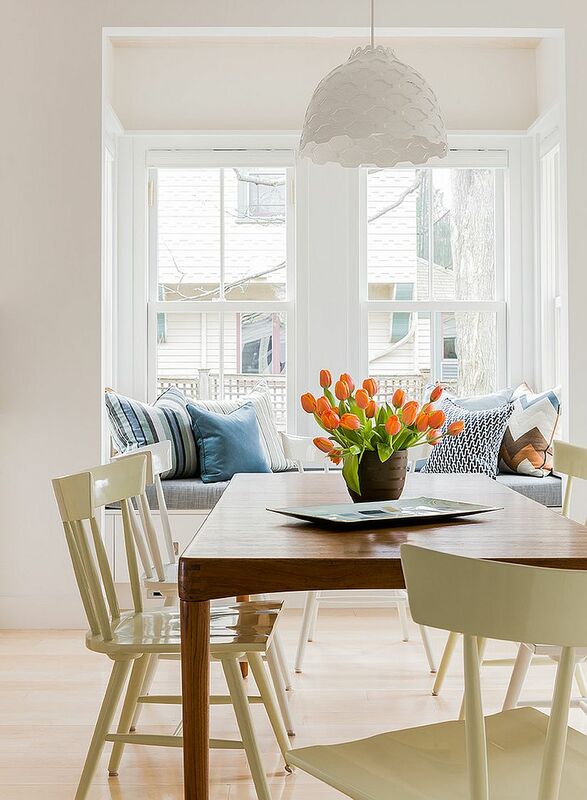 When it comes to banquettes that need to fit in with Scandinavian design, it is best to use color in moderation. 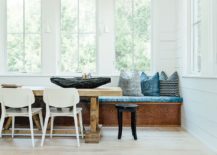 It is often the plush seating of the banquette that brings color to these dining spaces, but a wiser option would be to keep the bench seat as neutral as possible. Instead, turn to throw pillows, cushions and other decorative pieces to add color to the banquette dining area. 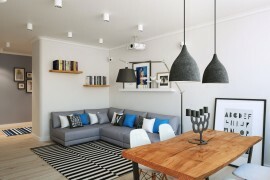 This gives you plenty of decorating flexibility, and you can change the accent colors as trends wax and wane over time. 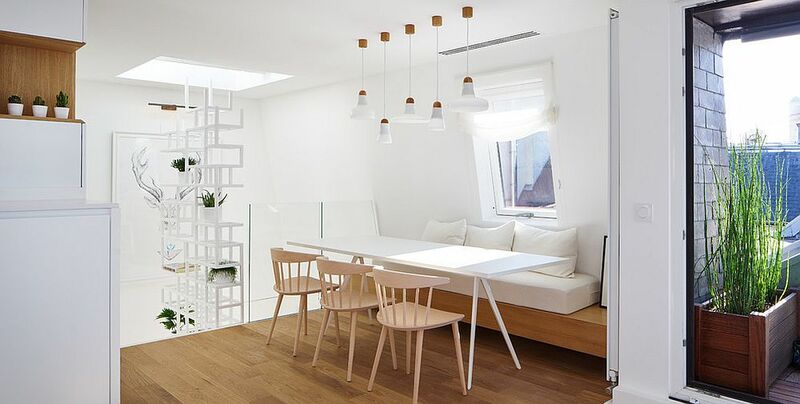 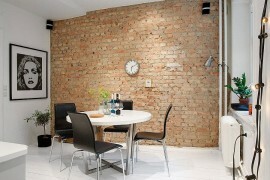 It keeps the core design of the dining space constant. 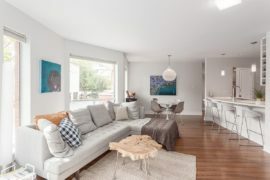 There are times when the kitchen in the backdrop or the living room in the foreground brings color to the Scandinavian dining space with banquette. 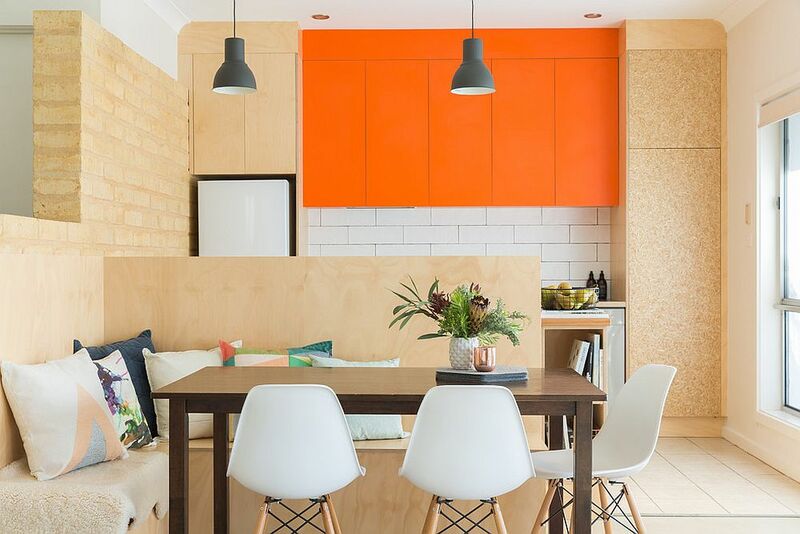 All you need to do here is repeat the dominant hue of the living area or the kitchen in the dining space, but with subtlety and discretion. 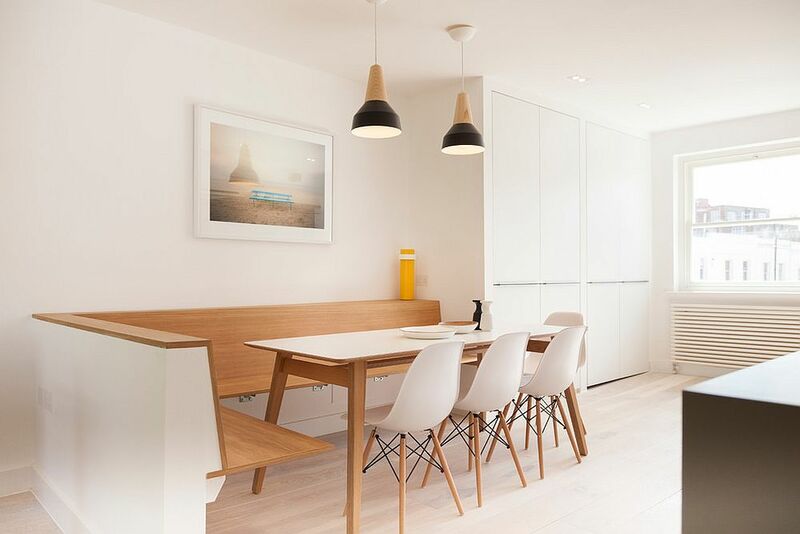 Pendant lighting above the corner banquette and additional chairs around the dining table can also add color to the classy Scandinavian space. 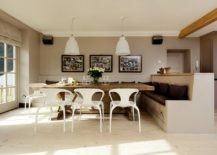 There are a few essential elements of Scandinavian design that you simply cannot miss as you go about designing a fabulous dining room with Nordic beauty and banquette seating. 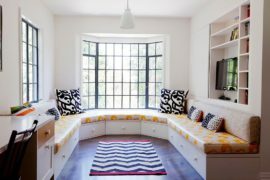 Natural light is a key component, and with most corner banquettes finding space next to large windows, this is barely ever an issue. 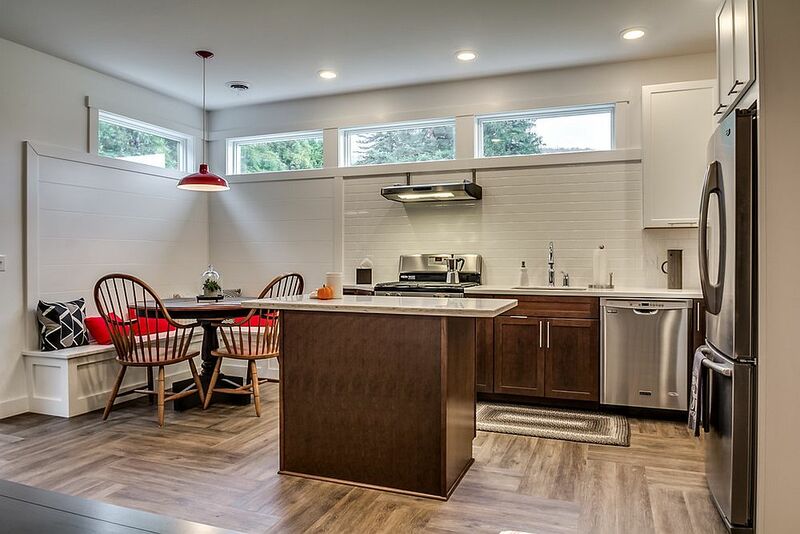 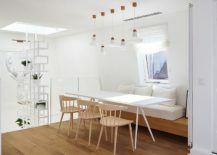 If you live in a home where bringing in a flood of natural light is just not possible, then turn to an efficient blend of recessed and pendant lighting. 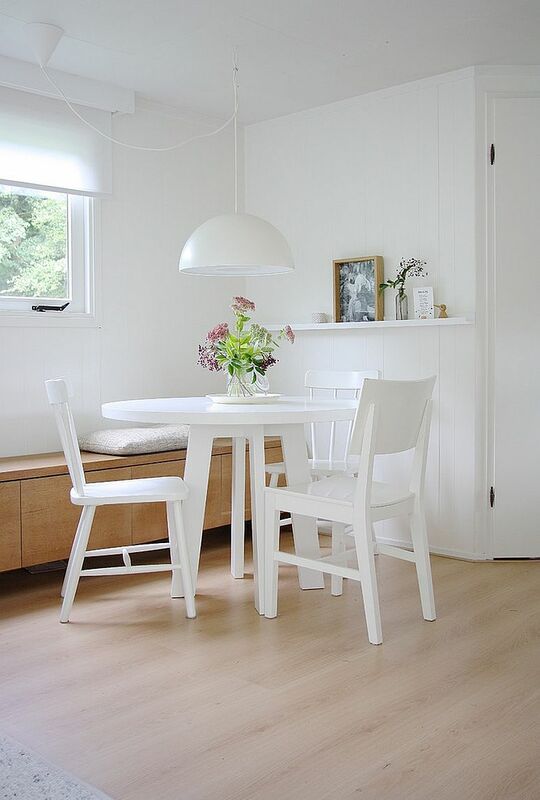 Bright white walls are another common feature, and they also add to the well-lit and cheerful image of the Scandinavian dining area. 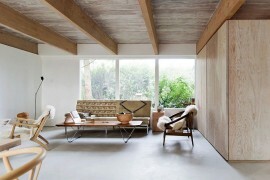 Finally, there is natural wood and its inviting warmth. 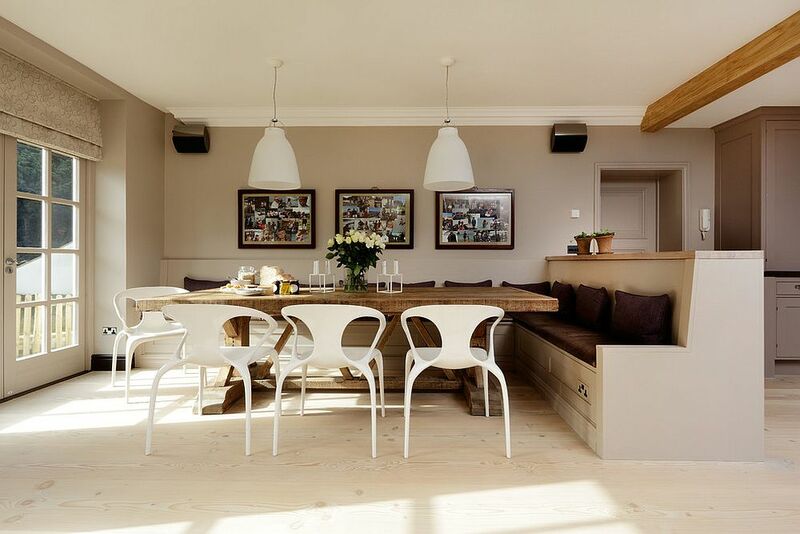 No Scandinavian dining room is complete without its presence and this can be easily achieved by adding a banquette crafted from natural wood in a light colored stain. 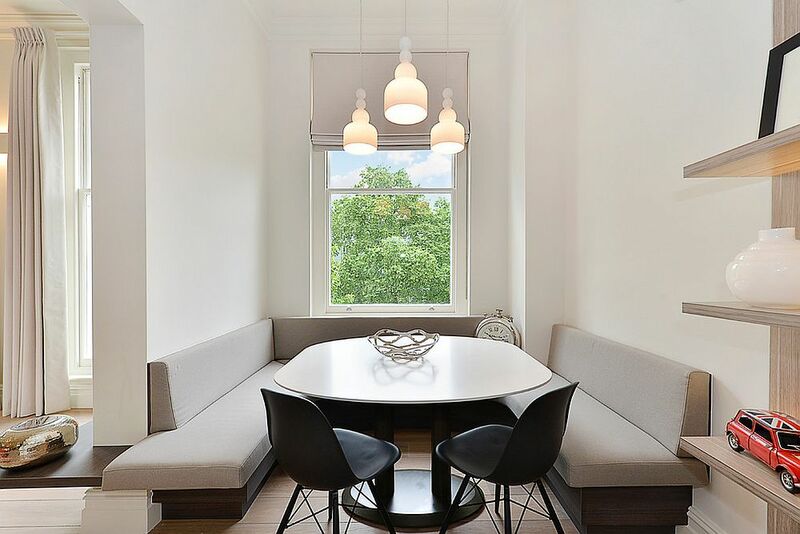 Add a wonderful natural timber or even a live-edge dining table to this banquette setting and you are all set!